While GameStop's Spring Sale carries lots of decent deals, Walmart has price matched (and beaten) many of these offers and in fact will be the better choice to buy given you'll receive free 2-day shipping at the threshold of only $35+. Great deal includes new titles such as Kingdom Hearts III, Red Dead Redemption 2, Metro Exodus, and Resident Evil 2 all for $40 at 33% off. While GameStop's Spring Sale carries lots of decent deals, Walmart has price matched many of these offers and in fact will be the better choice to buy given you'll receive free 2-day shipping at the threshold of only $35+. Great deal includes new titles such as Kingdom Hearts III, Red Dead Redemption 2, Metro Exodus, and Resident Evil 2 all for $40 at 33% off. Walmart's Black Friday Sale is now live and while the server was having some issues in the initial hours, things seem to have resolved by now. You'll find dirt cheap games starting at $17, great prices on gaming laptop, and tons of HDTV deals. Free 2-day shipping on almost all orders above $35. Walmart's pre-Black Friday sale is live with a few notable items including $199 PS4 Slim with Spider-Man, PS VR Creed + Superhot VR bundle, and a Dell G3 15 gaming laptop for only $600 Be sure to check back as we add more to the list. Free two day shipping included on almost all orders. From those giant batches of pre-order deals, to now a bunch of pre-owned games at super low prices, Walmart is going all-in on video game this summer. We're spotting super cheap stuff like $5 Battlefront and $19 FFXV for PS4, plus $13 Gears of War 4 for the Xbox One. Many titles are at historic low price. Click through to see full list and price history. 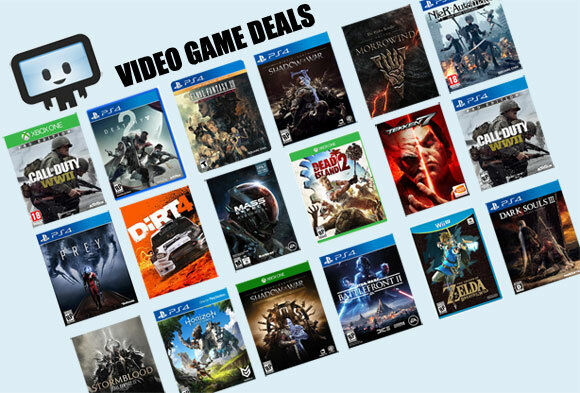 When you think of deals on pre-order console video games you think of Amazon or Best Buy with their Prime and Gamers Club Unlocked memberships. Walmart is skipping the yearly fees and giving outright preorder discounts on a ton of titles today. Get up to 28% off titles like Dishonored Death of the Outsider, Pokemon Ultra Sun/Moon, Wolfenstein II: The New Colossus, Monster Hunter World, Fire Emblem Warriors, Xenoblade Chronicles 2, and more.